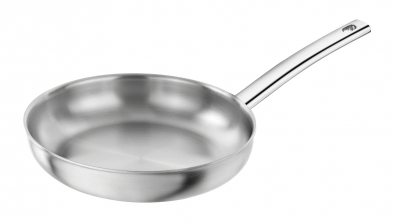 This uncoated range of frying pans are ideal for searing meat. It has a SIGMA-Clad 5-ply base with a total of five layers. The two outer layers are made of 18 / 10 and 18 / 0 stainless steel. The 18 / 0 stainless steel layer is magnetic, so you can use this pan on an induction hob. The three inner layers of the pan base are made of different aluminium alloys. The tough core ensures that the heat is distributed evenly over the entire cooking surface. Safeguarding your food and especially meat are cooked evenly in the centre and at the sides of the pan. The multi-layered material of the ZWILLING frying pan means that it sits flat on the hotplate guaranteeing that no heat is lost and the temperature can be reduced sooner. The even surface means that the oil is equally distributed, so burning, even in the most critical areas, is prevented. High-quality 18/10 hygienic stainless steel finish.